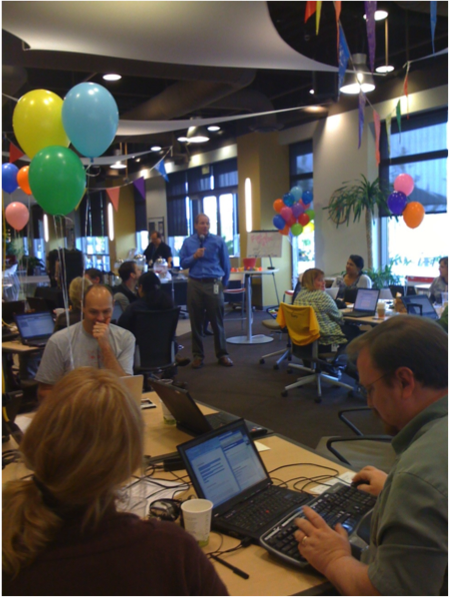 Name of company entering: Intuit, Inc.
How does a seasonal business with 800 employees scale help to meet the needs of more than 20 million customers? Simple. Create a community that enables customers to help each other. Since its launch in 2007, the TurboTax Live Community has helped more than 10 million unique customers get free, contextually relevant answers to their tax questions while contributing to an improved customer experience. In that time, there have been 27 million views of questions and answers in the community. Who would want to answer questions in a tax community? Millions of TurboTax customers actively participate in the Community, asking and answering questions, creating a robust, long-tail knowledge base that is easily accessed and searched. 90 non-employee super users – this group of extraordinary volunteer experts contributed over 115,000 answers last year alone. To make them even more special, this group offers their expertise for free: not only does TurboTax not pay them; they also do not sell any services of any kind through the community. The vast majority of all TurboTax employees (650+) contribute answers, including the GM and VPs of Product Management, Customer Experience, Engineering, and Marketing. The next step for the Live Community was to increase awareness and use. After conducting a holistic review of online channels, the team chose display advertising as the right venue to test a new way to bring the Live Community experience to users all over the Internet, wherever and whenever they need the help. The goal with this sort of social/advertising mashup is usage. 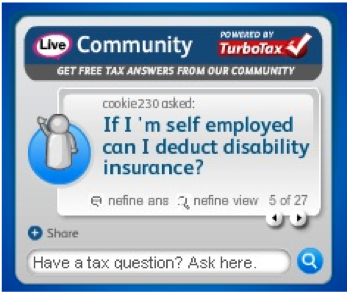 So did people use the Live Community support TurboTax offered? 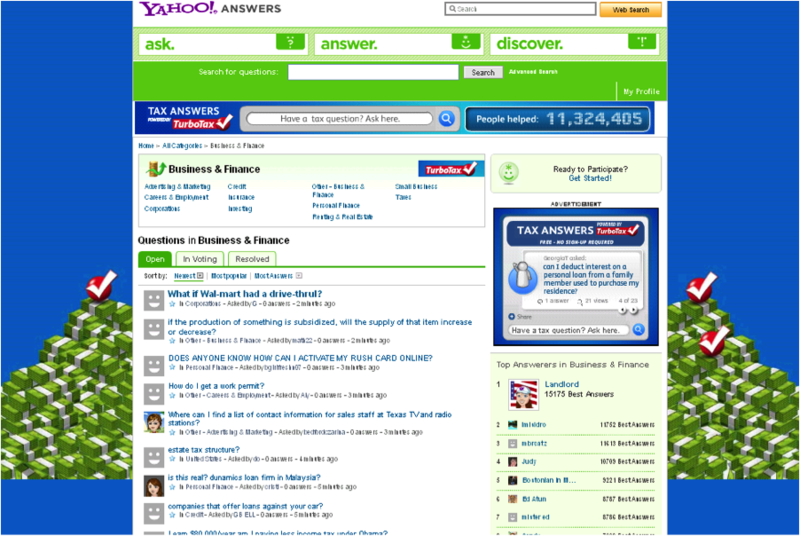 To catch people at the time and place they most need tax help, TurboTax did a first-ever custom integration of Live Community into the Business and Finance section of Yahoo Answers – and consumers really reacted. The Live Community integration saw a 58% higher engagement rate than when featured on other Internet locations. 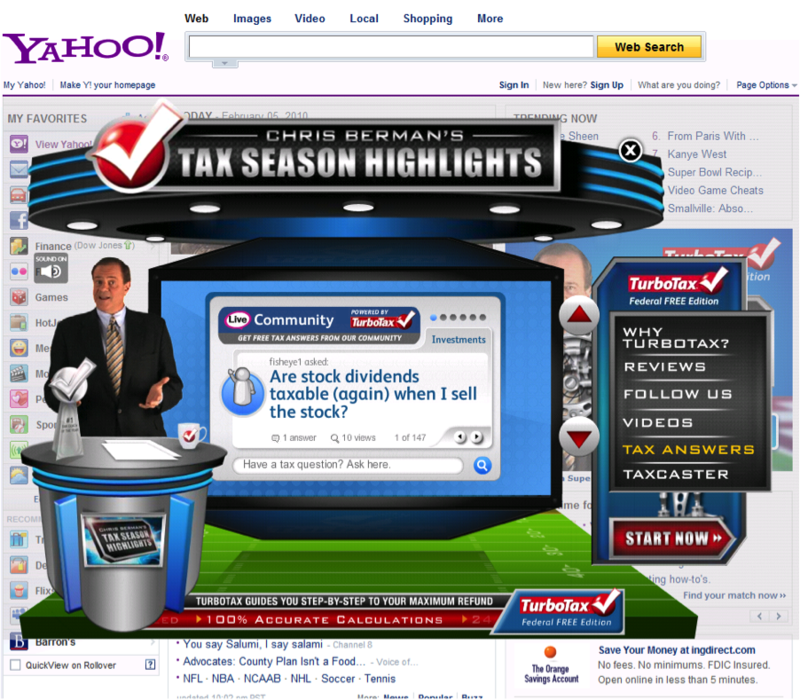 To reach an even broader audience TurboTax ran its award winning “TurboTron” rich media unit on the 2010 Pro Bowl and Super Bowl weekends on Yahoo, AOL, MSN homepages. This ad was seen over 800M times! With many interactive experiences to choose from in this customized ad unit, the Live Community was the most engaging part of the experience with a 61% engagement rate compared to the next closest (of 5 panels of content).